Aside from Thanksgiving, Easter is probably my favorite food holiday. Roast lamb, rice pie, ham pie (pizzagain)...all things that I love, made even more special because I only have them once a year on Easter and the fact that they are all expertly made by my mother. Oh yeah, how could I forget the Cadbury Mini Eggs...I really love those too! 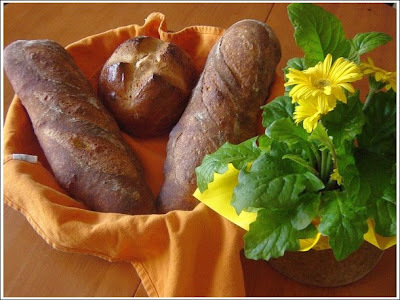 Here's my contribution to this years meal, two loaves of french bread and an Easter Rye. Whether or not you celebrate Easter (you can still have the Mini Eggs at least), have a great day!